Brazilian police have arrested former President Michel Temer on corruption charges. He was detained in his hometown of Sao Paulo on Thursday and taken into custody. Michel Temer was arrested this morning in São Paulo as part of Operation Car Wash. A Rio de Janeiro judge also issued an arrest warrant for a former Mines and Energy minister, Moreira Franco, and six more people. Michel Temer arrested in Rio as part of an anti-corruption probe; he was in office from 2016 to 2018. A court in Rio de Janeiro earlier announced that it had ordered Temer’s arrest. He is being investigated by the Car Wash task force for corruption, money laundering, and conspiracy, and for receiving bribes from companies in the port industry. The investigations started when Temer was in office, after an order issued by the Supreme Court, but the Congress rejected the charges at the time. But after Temer left office this year, he lost the special privileges he enjoyed as president and the Supreme Court submitted the four cases pending against him to a lower court. He has been charged in three of the cases. The former president is suspected of receiving hundreds of thousands of dollars in bribes from construction companies while he was the country’s vice president. Temer served as vice president under President Dilma Rousseff between 2011 and 2016. He assumed the presidency in August 2016 after Rousseff was impeached for alleged budgetary violations. He served in the post until the end of last year. 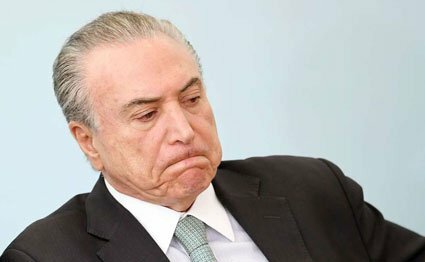 In June 2017, prosecutors charged Temer with receiving bribes. But lawmakers in the lower house of the National Congress voted to block his indictment. Last year, former President Luiz Inacio Lula da Silva was jailed, after he was found guilty of taking about one million dollars in bribes from a major construction company while in office. He led a leftist administration for eight years until 2011.